An evaluation made of rainfall, surface water, groundwater, and water quality monitoring networks in Salinas River basin in southern Monterey County, California, proposed all long-term rain gages be continued for extending short-term records and suggested the installation of two additional recording gages. Eight new storage rain gages were suggested at midaltitudes of east and west sides of Salinas Valley where few data are available. The evaluation revealed some short-term gaging stations could be discontinued because of good regression relations between them and the long-term stations Arroyo Seco near Soledad. Of 16 stations selected for the proposed network, 4 are new recording stations, 6 are new nonrecording streamflow and water quality sampling sites, 5 are existing stations, and the last is a station operated from 1969 to 1976; also included are water quality sampling stations on Lakes Nacimiento and San Antonio. The proposed groundwater network was developed from information on geology, geohydrology, and groundwater quality, high priority objectives for groundwater network, and consideration for providing good areal coverage of levels and water quality. Of 145 sites selected, 86 are existing monitoring wells. Continuing data collection and analysis are vital to efficient development and management of water resources. To insure that water managers have adequate information on conditions and trends, data-collection programs must be evaluated and updated periodically. Changes in population, land use, and agricultural practices may increase the demand for water, so that effective water management and supporting data collection become even more critical. Consideration of cost effectiveness, however, means that every site must count, and redundancy must be minimized. Water resources management and monitoring are ever-changing, and periodic reevaluation is a necessary part of this process. This report presents an evaluation of precipitation, surface-water, and ground-water monitoring networks in the northern Salinas River drainage basin of Monterey County, California. This report is third in a series of reports prepared in cooperation with the Monterey County Flood Control and Water Conservation District (MCFCWCD). 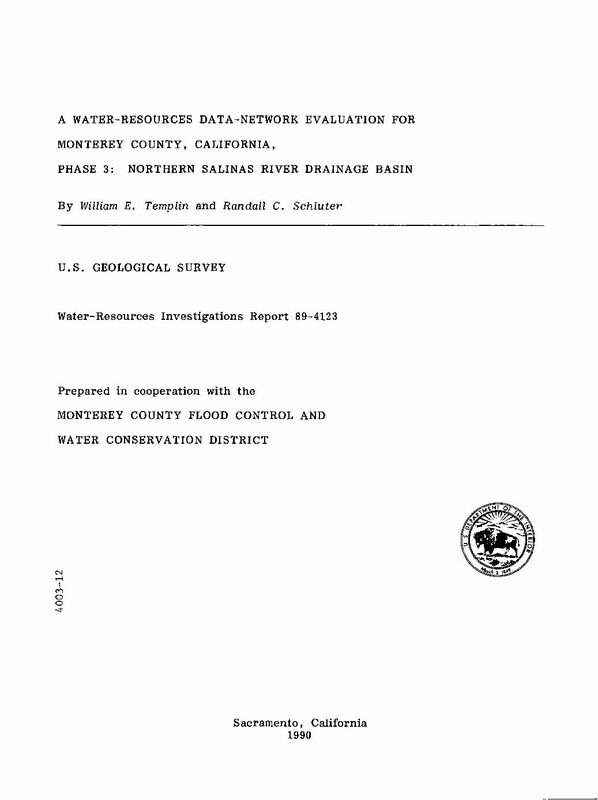 The phase 1 report (Showalter and Hoffard, 1986) covers the southern Salinas River drainage basin, the phase 2 report covers the north county and coastal areas of Monterey County (W.E. Templin, P.E. Smith, and R.C. 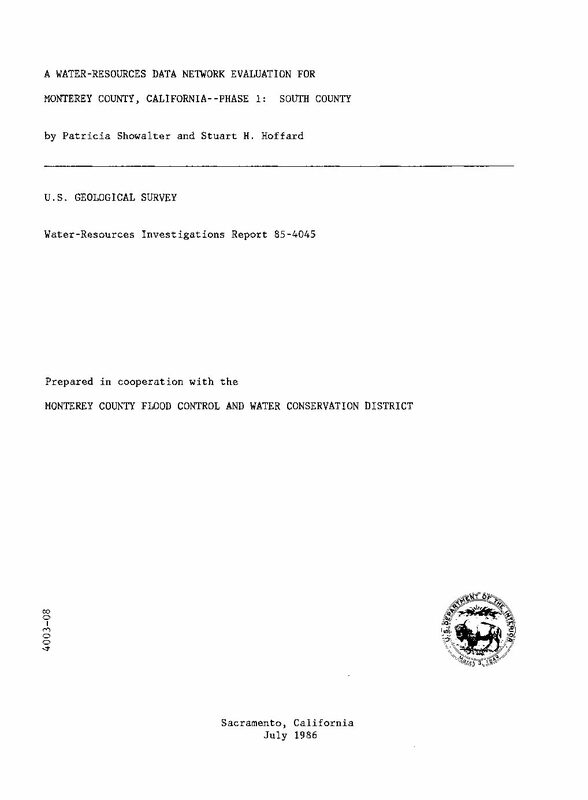 Schluter, U.S. Geological Survey, written commun., 1989), and this report (phase 3) covers the northern Salinas River drainage basin. This report presents an evaluation of water resources data collection networks in the northern Salinas River drainage basin, Monterey County, California. The evaluation, done in cooperation with the Monterey County Flood Control and Water Conservation District, covers both quantity and quality monitoring by precipitation, surface-water, and ground-water networks. The report describes existing networks in the study area and possible additional data collection. The study identified 34 precipitation gages in the study area, of which 20 are active. The stations are concentrated in the northwestern part of the study area. Data are lacking for the eastern and southern parts of the study area, as well as the southwestern slopes of the Gabilan Range. No precipitation-quality networks were identified. Possible data-collection efforts for precipitation quality include monitoring for acid rain and for pesticides in precipitation. The study identified 10 streamflow-gaging stations, of which 6 are active. To meet the objectives for streamflow networks that are outlined in the report, all sites could be reactivated, and two of the inactive sites could be relocated to improve the reliability of the data. Besides these stations, nine possible additional streamflow-gaging sites were identified. The Monterey County Flood Control and Water Conservation District samples one surface-water site for suspended sediment, specific conductance, and chlorides. Several agencies have done water-quality sampling in the past, but only five sites are active. Reactivation of the 45 inactive sites might help to meet the various surface-water-quality objectives described in the report. Development of a stream-reach rating system also could help to identify parts of the study area most in need of sampling. The Monterey County Flood Control and Water Conservation District maintains three networks to measure ground-water levels on a monthly basis, during peak irrigation, and at the end of the irrigation season. The District measures water levels in 318 wells. The only other network identified for this report was operated by the U.S. Geological Survey, and none of its five wells are active. The study identified 128 sections in which no ground-water-level monitoring is presently done. Well coverage is densest in the saltwater-intrusion areas near Castroville, California. Wells in the rest of the study area are more sparsely distributed and are concentrated down the center of the drainage basin in the alluvial ground-water basin. The ideal initial baseline network of ground-water-quality wells would be an evenly spaced grid of index wells within each aquifer, with a density of one per section. Once baseline conditions were established, representative wells could be selected and monitored annually. 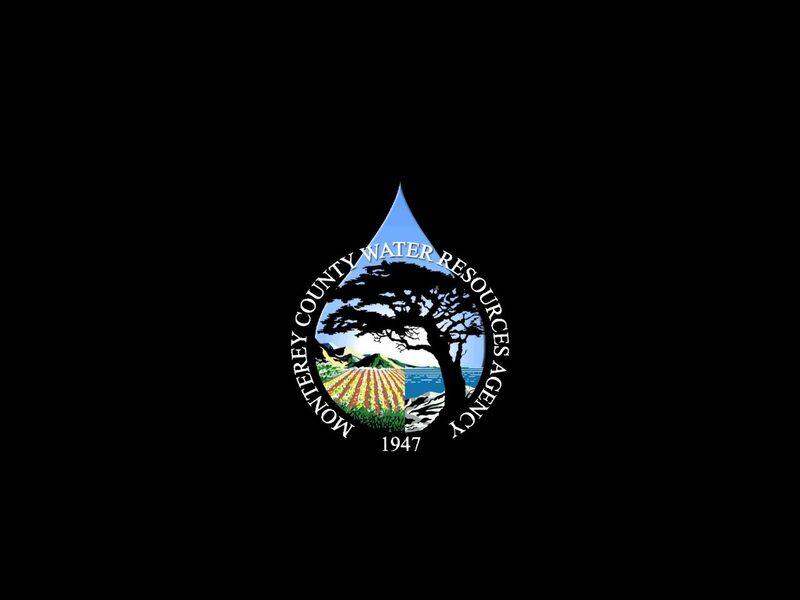 As of 1985, the Monterey County Flood Control and Water Conservation District monitored 379 study wells in the area for various water-quality conditions. Other networks monitor (or propose the monitoring of) 135 wells. The District collects samples in summer months to monitor saltwater intrusion near Castroville. Annual samples also are analyzed for chloride, specific conductance, and nitrate. Every 5 years, the District does a complete mineral analysis on each study well. Improvements in network coverage are suggested to better approximate ideal network coverage. The adequacy of wells in existing monitoring networks for representing actual conditions in the ground-water basins was not established conclusively. Possible redundancy of information from existing networks was not evaluated statistically. Despite these limitations, this report does provide a basis for assessing the adequacy of ground-water-level networks in the study area. The computerized Geographic Information System (GIS) that is planned for Monterey County could easily use the information in this report for the needed initial analysis of network adequacy. The feasibility of management and analysis of large complicated data bases (such as the ground water networks identified in this report) is substantially improved through the use of state-of-the-art GIS tools now available. 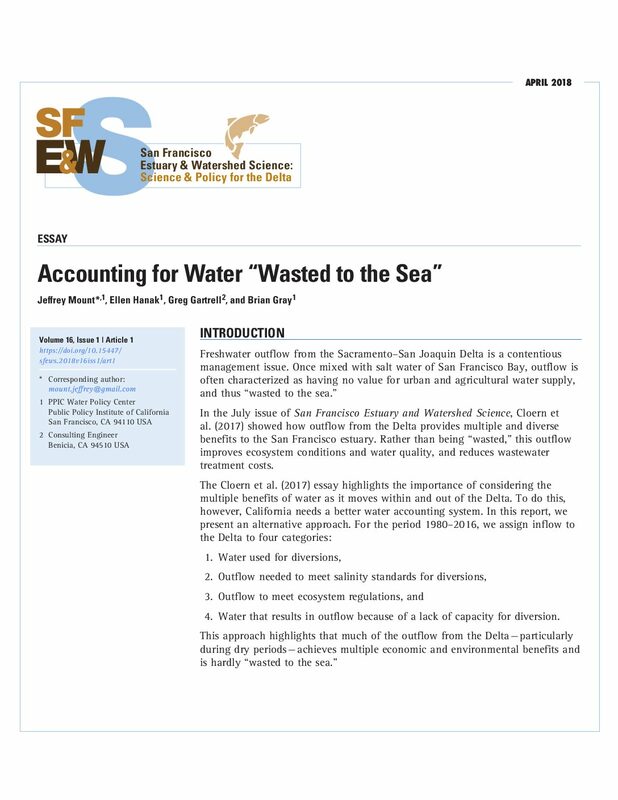 This report evaluates the cost and utility of adding coupled surface and near-bottom salinity monitors along the axis of the San Francisco Estuary, and the types of equipment and approximate costs of this additional monitoring effort. Expanding the monitoring network by adding downstream monitoring stations, adding stations at depth, and increasing the resolution of monitoring stations along the axis of the estuary will generate data that capture tidal dynamics and may be used to derive equations that predict salinity and other hydrodynamic endpoints with greater precision than currently possible. The proposed monitoring is expected to enhance the hydrodynamic modeling of the salt field and the accuracy of compliance and prediction methods in the estuary. Springtime outflows through the San Francisco Estuary are managed through the position of the 2 parts per thousand bottom salinity isohaline (X2) along the center-line of the estuary, measured in kilometers relative to the Golden Gate Bridge. X2 is calculated from surface salinity measurements with a constant vertical conversion factor. The current framework of sampling stations does not collect near-bottom salinity along the estuary center-line, does not extend far enough down-estuary to adequately characterize X2 during high flows, and the separation of monitoring locations limits the precision with which the position of X2 can be calculated. Near-surface and near-bed salinity and turbidity sensors and ancillary hardware could be added to the estuary for an estimated cost of ~ $780K in capital costs and $500K/yr in operation, maintenance, and data processing costs based on a proposed addition to an existing surface salinity network in San Francisco Estuary operated by the US Geological Survey. While this document does not recommend a particular plan for implementation, the compiled information provides rough costs for planning considerations. Data collected through a network of this kind could improve precision of compliance methods with the existing Delta outflow standard. With data collected over time, it would support modifications to a new/modified Delta outflow standard, improve our ability to assess the effectiveness of water quality standards, and improve protection of water supply and aquatic life habitat. These data would also improve the salinity modeling capability and accuracy for future predictions and past evaluations. Expanding the monitoring network also provides a platform to connect hydrodynamic and biological measurements which is necessary for integrating biological and hydrodynamic modeling and advancing knowledge of estuarine mechanisms that influence fish population trends. The specific design of a monitoring network and whether or not the improvements can be optimized for their potential outputs was beyond the scope of the present document and needs to be based on a broader discussion among science experts, regulators, and the regulated community. 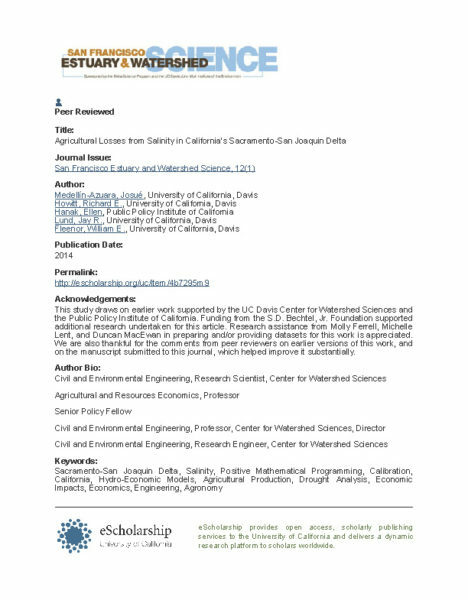 Sea level rise, large-scale flooding, and new conveyance arrangements for water exports may increase future water salinity for local agricultural production in California’s Sacramento–San Joaquin Delta. Increasing salinity in crop root zones often decreases crop yields and crop revenues. Salinity effects are nonlinear and vary with crop choice and other factors including drainage and residence time of irrigation water. Here, we explore changes in agricultural production in the Delta under various combinations of water management, large-scale flooding, and future sea level rise. Water management alternatives include through-Delta water exports (current conditions), dual conveyance (through-Delta and a 6,700 Mm3 yr?1 [or 7500 cfs] capacity peripheral canal or tunnel) and the flooding of five western islands with and without peripheral exports. We employ results from previous hydrodynamic simulations of likely changes in salinity for irrigation water at points in the Delta. We connect these irrigation water salinity values into a detailed agro-economic model of Delta agriculture to estimate local crop yield and farm revenue losses. Previous hydrodynamic modeling work shows that sea level rise is likely to increase salinity from 4% to 130% in this century, depending on the increase in sea level and location. Changes in water management under dual conveyance increase salinity mostly in the western Delta, and to a lesser extent in the north, where current salinity levels are now quite low. Because locations likely to experience the largest salinity increases already have a lower-value crop mix, the worst-case losses are less than 1% of total Delta crop revenues. This result also holds for salinity increases from permanent flooding of western islands that serve as a salinity barrier. Our results suggest that salinity increases could have much smaller economic effects on Delta farming than other likely changes in the Delta such as the retirement of agricultural lands after large-scale flooding and habitat development. Integrating hydrodynamic, water salinity, and economic models can provide insights into controversial management issues. 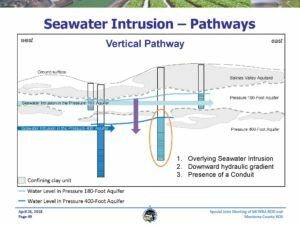 The Alamitos Barrier Project (ABP) was designed and constructed to protect the groundwater supplies of the Central/Orange County Basin of the Coastal Plain from the intrusion of seawater through the Alamitos Gap area. The project facilities are located near the Los Angeles-Orange County border about two miles inland from the terminus of the San Gabriel River. The original facilities included injection wells to form a freshwater pressure ridge and extraction wells to form a saltwater trough. The freshwater pressure ridge has proven to be historically effective, whereas the saltwater trough has not. As a result, the extraction wells are currently not in operation. A map showing the supply pipeline, injection wells, extraction wells, and observation wells is shown on page A-12.1. 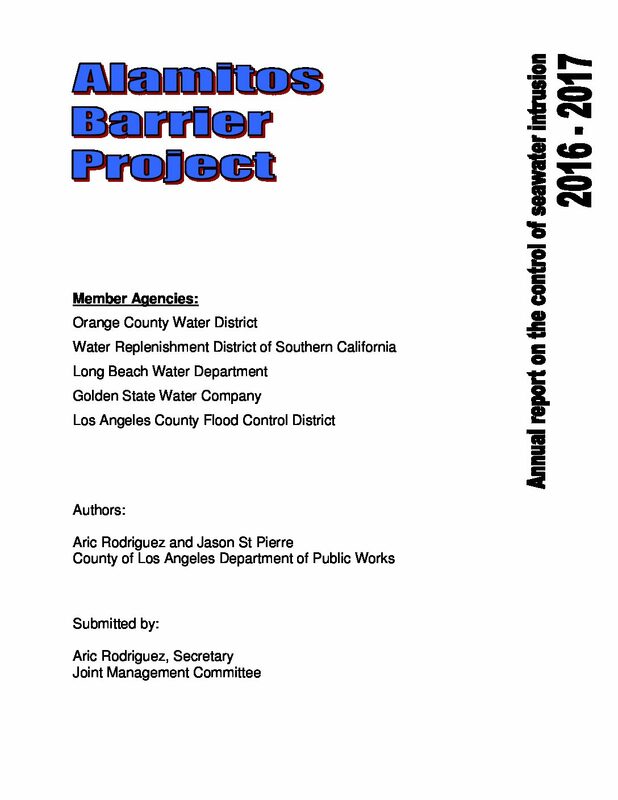 The County of Los Angeles Department of Public Works (Public Works) operates and maintains the ABP and its associated facilities under the direction and approval of the Joint Management Committee (JMC), acting on behalf of the Los Angeles County Flood Control District (LACFCD) and the Orange County Water District (OCWD). This report summarizes design and construction issues, operation and maintenance activities, hydrogeologic effects, chloride concentrations, and project costs for Fiscal Year (FY) 2016-17 (i.e., July 1, 2016 through June 30, 2017). 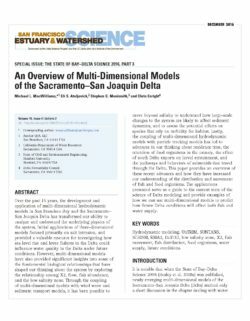 Over the past fifteen years, the development and application of models in San Francisco Bay and the Sacramento-San Joaquin Delta has transformed our ability to analyze and understand the underlying physics of the system. Initial applications of three-dimensional models focused primarily on salt intrusion, and provided a valuable resource for investigating how sea level rise and levee failures in the Delta could influence water quality in the Delta in the future. However, multi-dimensional models have also provided significant insights into some of the fundamental biological relationships that have shaped our thinking about the system by exploring the relationship between X2, flow, fish abundance, and the low salinity zone. Through modeling, it has been possible to move beyond salinity to understand how large-scale changes to the system are likely to affect sediment dynamics, and to assess the potential effects on species that rely on turbidity for habitat. Lastly, the coupling of multi-dimensional hydrodynamic models with particle tracking models has led to advances in our thinking about residence time, the retention of food organisms, the effect of south Delta exports on larval entrainment, and the pathways and behaviors of salmonids that travel through the Delta. This chapter provides an overview of these recent advances and how they have increased our understanding of the distribution and movement of fish and food organisms. The applications presented serve as a guide to the current state of the science of Delta modeling and provide examples of how we can use multidimensional models to predict how future Delta conditions will affect both fish and water supply. 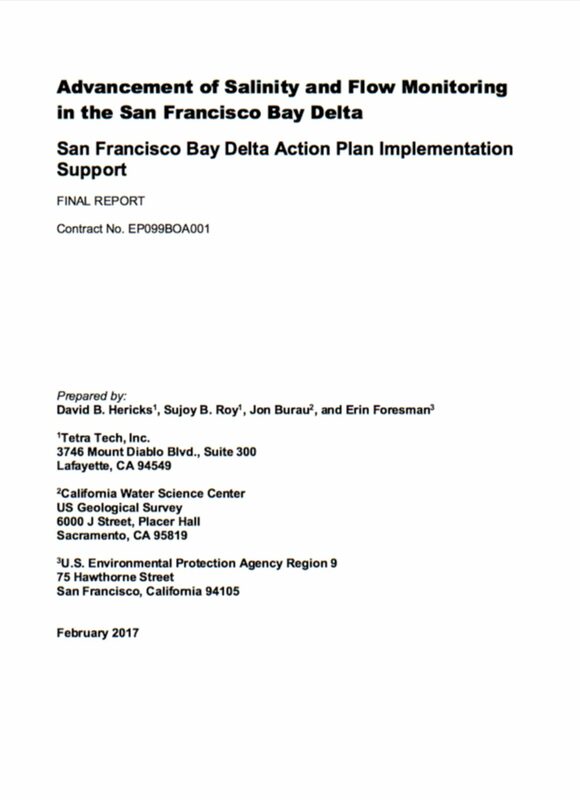 The California State Water Resources Control Board (Board) is tasked with updating the 2006 Water Quality Control Plan for the Bay-Delta Estuary (Bay-Delta Plan). The Board planning activities for this process have four phases. Phase 1 focused on San Joaquin River flow requirements and southern Delta water quality objectives. The current phase (Phase 2) focuses on fish and wildlife beneficial uses. Phase 3 will focus on modifications to water rights and Phase 4 will focus on the development and implementation of flow requirements for priority Delta tributaries. Phase 2 workshops were held to conduct discussions and generate information regarding the scientific and technical basis for considering potential changes to the Bay-Delta Plan. The workshops were informal; the Board did not take any official action and there was no sworn testimony. 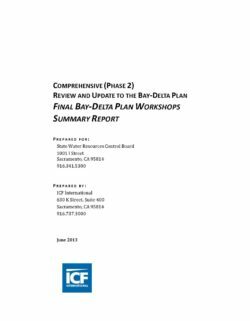 Information provided during the workshops will augment information developed through earlier reviews and will inform the Board members and staff on what, if any, changes should be made to the Bay-Delta Plan. Three workshops were held. Full workshop agendas are provided in Appendix A. 1. Ecosystem Changes and the Low Salinity Zone, September 5–6, 2012 – including the effects of the low salinity zone on various estuarine species, the interaction of salinity with non-flow related factors, and the identification of modeling or other tools that can be used to measure and reasonably protect estuarine habitat. 2. Bay-Delta Fishery Resources, October 1–2, 2012 – including flow, cold water pool, habitat, and water project operational constraints needed to reasonably protect Central Valley steelhead, Sacramento River winter-run, Central Valley late fall–run Chinook salmon, and pelagic species (including Delta smelt and longfin smelt); and the interaction of these issues with non-flow related factors. 3. Analytical Tools for Evaluating the Water Supply, Hydrodynamic, and Hydropower Effects of the Bay-Delta Plan, November 13–14, 2012 – including the CalSim II water supply model, DSM2 and RMA2 hydrodynamic models, Plexus hydropower model, and others as applicable, together with results from applying these models to various scenarios.